When it comes to decorating front porches and doors for fall, there are many inexpensive and easy ideas. As summer comes to an end and the weather starts to cool down many people start to think about fall decorating. Since autumn is the beginning of the entertaining season, many people will be getting ready to invite guests into their homes. So welcome visitors with a front porch that radiates an inviting and warm feeling, one that friends and family will want to come back to throughout the season. When decorating a front porch for autumn, think about using traditional fall decorating items (ones that will last until it’s time to decorate for the holidays) – but don’t stop there. While pumpkins are always a good choice, there are many others worth considering. Be creative when coming up with ideas for outdoor fall decorating. Visit local craft stores as well to look for inspirational autumn decorating schemes. When it comes to outdoor decorating for fall, wreaths are an obvious choice. Wreaths come in an assortment of sizes and a wide array of styles and colors and can be purchased at craft stores, nurseries, grocery stores and the like. For DIY types, they can be made fairly quickly and easily. For instance, a simple but stunning cranberry wreath can be made using a store-bought foam wreath form. Simply string cranberries in rows along the wreath, using pins to attach the ends of the cranberry strings to the form. Add some elegance to the wreath by using thick colorful ribbons tied around the wreath form. A great alternative to a floral or fruit wreath is to use bundles of wheat, tied together with ribbons in rich autumn colors. These arrangements can be cut to any size and hung on the door either horizontally or vertically. The look is simple, yet just right for the season. The other traditional fall/thanksgiving decoration is the cornucopia, or horn of plenty. Why not create a warm autumn welcome with a fall cornucopia on the door? To make one, create a cone out of wire mesh, preferably copper. Create an arrangement of fall flowers, wheat and branches. This arrangement can be set into a piece of floral foam. To disguise the floral foam, fill the inside edges of the cone with nuts, berries, small pinecones, and more wheat. Hang on the door with both the wide and narrow end of the cone affixed to the door to keep the arrangement upright. Mums (and other flowers that bloom during this time) are affordable and look great. Try hanging them in baskets over a porch. Plant additional mums in the ground to line walkways and driveways. Urns, either in pairs or on their own, are elegant when placed near the front door. Fill them with traditional fall foliage and don’t forget to include some pinecones, branches, berries, and leaves. If space allows, bales of hay can add a lovely fall touch to the front porch. They can add a stable base on which to place pumpkins, potted plants, and other fall decorations. Attach corn stalks to columns or railings on the front porch. Consider tying some together with ribbons in fall colors. Purchase preserved gourds and place them outside doorways and in pots around the porch. Old leather boots can creatively be worked with. Try filling them with mums and place them near the front door. Leaf garlands can be made by stringing fall leaves together, then hang the garland on the doorframe or any other place you desire. Fall is the best season of the year and also the season of creation. With pumpkins, dried leaves, reusable items, and some other items you can create beautiful, unique decor for the porch of your home. The main colors of Fall are brown, orange, yellow, red and blue. We have collected over 25 stylish Fall Porch designs and you can choose the most suitable model for your home. 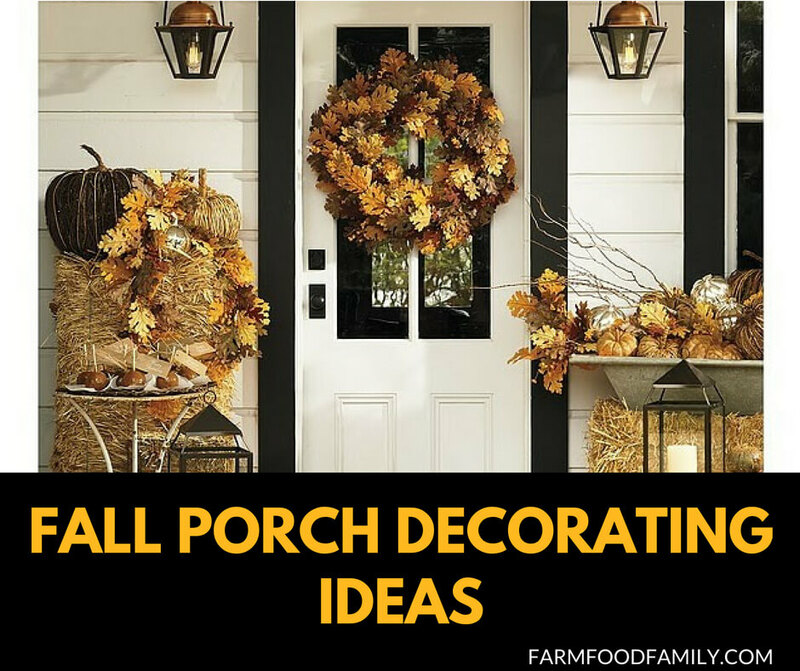 There are endless options when it comes to decorating front porches and doors for fall. Many of them are easy and inexpensive. So get your outdoor decorating creative juices flowing! Wonderful and inspirational ideas! I love the wreaths – always a nice touch to any fall decor.